For a few generations now, Huawei has been cultivating a specific look on its devices. The machined aluminium metal unibody combined with the gaps required for the antenna meant that the Mate S, the Mate 8, the Mate 9, and the P9 felt like part of the family. I didn’t get the same feeling with the base P10 models, and I also don’t get the same feeling with the Mate 10 either. There are three immediate reasons I can think of. First are the color choices. As I am writing this piece, I have only seen the Mate 10 and Mate 10 Pro in dark colors. 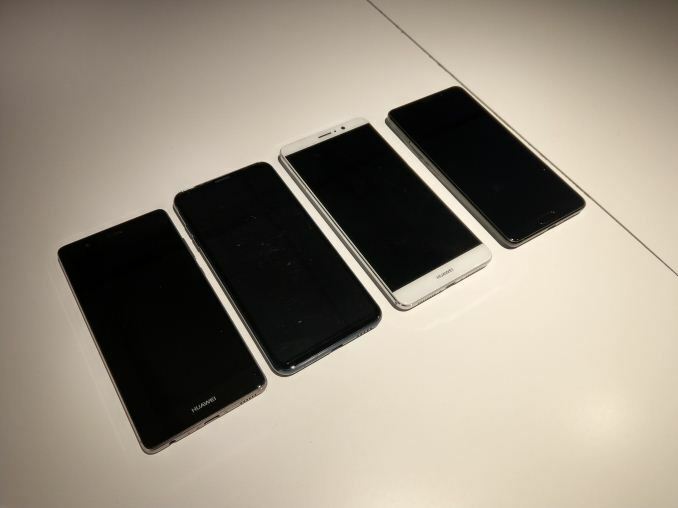 When I put them side-by-side with other devices, it does not look significantly different. This is especially true in low light, and there’s no defining ‘Huawei’ feature. On the rear, the dark color again hides the fact that it is a Huawei device, aside from the perhaps odd way the dual cameras look. There is a band on some of the colors to signify a ‘strip’ where the cameras are, but this is not part of Huawei’s regular look. The strips we have seen to date come on the P9 and P10, not on the Mate units. One caveat to all this: when Huawei launched the P10 in ‘Greenery’, in collaboration with Pantone, it seemed odd at the time. But I can now pick that phone out of a crowd, it is so obvious. There is something to be said about being different. A note on colors: the Mate 10 will be offered in Mocha Brown, Black, Champagne Gold, and Pink Gold. The Mate 10 Pro will be in Midnight Blue, Titanium Gray, Mocha Brown, and Pink Gold. The Mate 10 Porsche Design will be in Diamond Black only. Second is the fingerprint sensor. This is perhaps more of a personal issue, but to date I have preferred rear fingerprint sensors. Moving to the front for the P10 put me off a little (especially in a dark color), and the fact that the regular Mate 10 now goes this way, with a thin fingerprint sensor, seems a little off-putting. Third is the display. With most major smartphone manufacturers focusing on this ‘all-screen’ display technology, there leaves little room for individualization for the OEMs to make a mark. Apple, either by luck or by design, got this right. Despite the backlash on the iPhone X about that little notch for the cameras, there is no mistaking that a phone with a notch is an iPhone X. The Mate 10 and Mate 10 Pro do not have the same instantly recognizable look. How to make it obviously recognizable (and different to the iPhone) is for someone paid a lot more than me to think about, but it means the Mate 10 and Mate 10 Pro have the potential to be lost in the crowd. The P11 (if there is one next year) will have to do something on this front. On the silicon side, at the heart of the new Mate 10 phones is the Kirin 970 SoC. 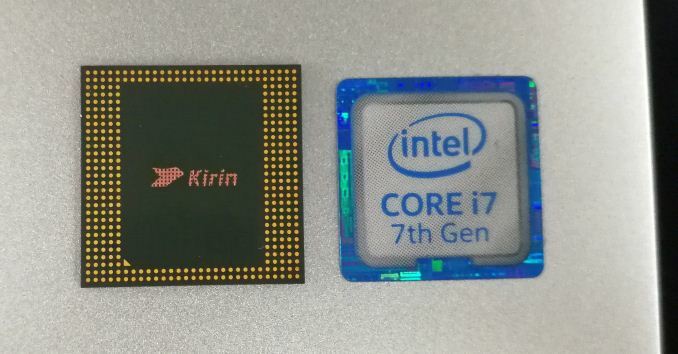 The new Kirin 970 is fabbed at TSMC using its smartphone-focused 10nm process. We were expecting Huawei/HiSilicon to be the first SoC vendor to 10nm last year, but its release cycle was just before 10nm ramped up for mass production. The chip uses the same ARM Cortex-A73 and ARM Cortex-A53 cores as the previous generation, although this time running from more mature blueprints. For the last generation Huawei was the first to the gate with ARM’s latest cores, which had a bit of concern on the power side as shown in Matt’s review. ARM announced the next generation A75/A55 cores earlier this year, but in true ‘not ready yet’ fashion for Huawei, these designs are not ready for mass production. 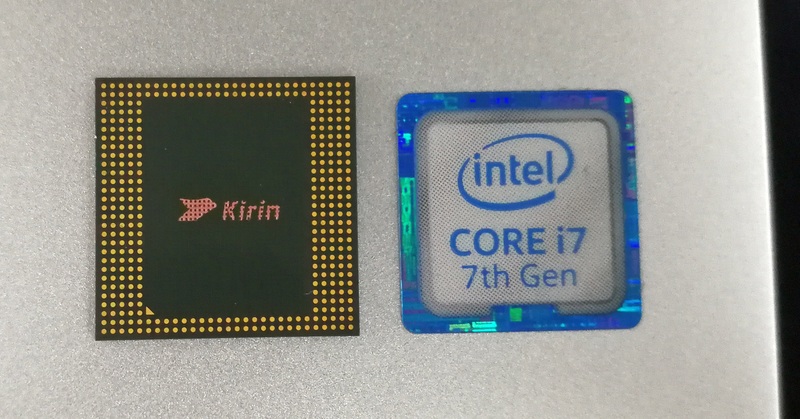 Aside from the A73/A53 cores, the Kirin 970 uses ARM’s latest Mali G72 graphics, this time in an MP12 configuration. This means a base +50% gain for graphics cores, along with the improvements from G71 to G72, but the benefits of a ‘wider’ graphics engine typically allow running it at lower frequencies, nearer the power efficiency point, and saving power. In the game of silicon cat and mouse, balancing die size with cost and power, Huawei has gone for added cost/die size in order to reduce power consumption. The third main metric for in the hardware is going to be its new ‘Neural Processing Unit’, or NPU. This is silicon dedicated to running artificial intelligence calculations and frameworks, in the form of neural networks. As with other task-specific processors, technically these AI tasks can be run on the CPU or GPU, but because an AI network can run at lower precision and have fixed calculation steps, by developing specific hardware it allows for higher performance at much lower power – the same basic rationale behind GPUs for graphics, ISPs for image processing, etc. The IP for Huawei’s NPU comes from Cambricon Technologies, and from a high-level might be considered similar to NVIDIA’s Tensor Cores. We are under the impression the Huawei NPU runs several 3x3x3 matrix multiply engines, whereas the Tensor cores run 4x4x4. 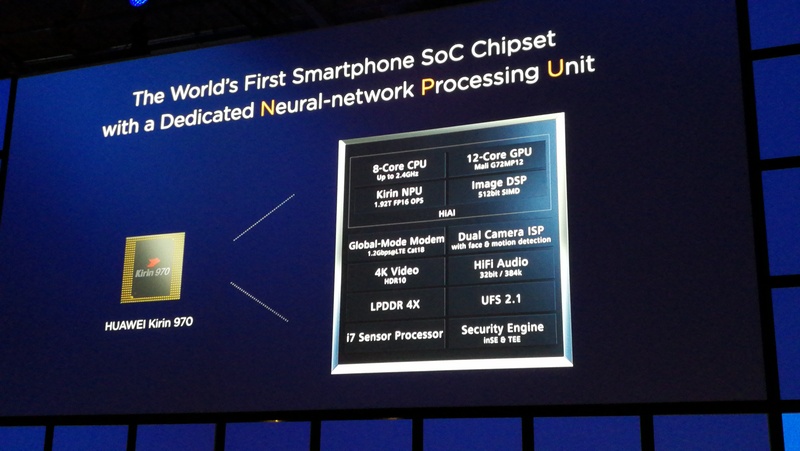 Huawei runs all this in 16-bit floating point mode, and has a listed performance of 1.92 TFLOPs. This is a relatively high number, and for reference is twice the throughput as what Apple quotes for its new Neural Engine found in the A11 Bionic processors for the iPhone 8 and iPhone X. The latest unconfirmed reports I have seen put Huawei’s NPU at around 25-30% of the full silicon area. They are quoting ‘under 100 mm2’ for the total die size, and a total of 5.5 billion transistors. That comes out to a surprising 55 million transistors per square millimeter using TSMC’s 10nm process, which is double that of AMD’s Ryzen design, and even above Intel’s own 48MTr/mm2 estimate given at their manufacturing day. If Huawei did not have an NPU, the die size would be a lot smaller, and here comes a fundamental fact as we move to even smaller process nodes (as in, physically smaller, rather than just a smaller number for a name): it becomes harder and harder to extract pure performance out of a non-parallel design. A chip designer either makes a smaller chip, or spends the transistors on dedicated hardware – either supporting a new video encoder algorithm, a new DSP, or in this case, hardware specifically for artificial intelligence networks. At the time, Anand predicted that Microsoft had all the key elements in place: an OS, a smartphone platform, and potentially a gaming platform in the Xbox. All Microsoft had to do was put them all together, although at the time they were focusing on other matters, such as Windows 8 and fixing Windows 8. Initially we saw Windows RT running on ARM on some hybrid tablets, but the ecosystem did not bite. Eventually we saw Windows' Continuum functionality hit the scene to not a lot of fanfare. It required significant grunt, and we saw a device from Acer, a device from HP, and it also had a slow death. Qualcomm are going to push the concept via the Windows on Snapdragon platform, using the Snapdragon 835. Qualcomm is working with Microsoft and combined they are working with most of the major laptop OEMs to provide ARM devices that can run almost a full-blown copy of Windows. These are still laptops though, and not Anand’s original vision of a smartphone. Huawei is going to try and roll its own solution to this. When connecting to a TV, a custom Linux interface will spring up like a traditional desktop operating system, somewhat similar to Samsung's recently launched DeX feature. Bluetooth devices can be connected, and it will have access to all the standard Android apps. The smartphone itself can act as a trackpad for a mouse, or a keyboard, and be connected to something like the MateDock (sold alongside the original Matebook) for additional functionality such as Ethernet, more USB ports, and additional video outputs. As the headlines for the Mate 10 will be around artificial intelligence, this feature is likely to be left into a footnote for now, similar to how DeX has been on the Galaxy S8 series. In order to get it off the ground, I suspect that Huawei will have to implement some type of ‘Desktop Dock’ that can allow for additional attachments as well as charging at the same time – at this point Huawei says that users will have to buy a splitter cable to support charging at the same time. This is the first generation, so there are some rough edges – it only supports displays at their native resolution up to 1920x1080 for now, and when using a Bluetooth device I did notice some lag. Other features, such as something similar to Windows Snap, should be high on the list. From the article: "All three devices have a headphone jack"
It's difficult to have a reliable IP67 or better rating with a headphone jack. Sony learned this with the Xperia Z3, and hasn't released anything claiming to be "waterproof" since. Courage isn't the angle Apple should have taken. They should have simply said fluid dynamics. It has already been proven a headphone jack can be added to an iPhone 7, that there is physical space inside, contrary to what Apple claims. Sony does have an IP68 rating with a headphone jack and Samsung does too - and have had that for a while now. Sony didn't have an uncovered USB port until Z5.